This is an important post of Ernest Julius's last written communication. He wrote in a handful of diaries over the years and this one would be his last. His life suddenly cut short by a sniper's bullet on October 10th, 1918 in the Argonne Forest in France. Ernest Julius words were written to someone and for who we will never know, yet just as many write their thoughts in journals, these words may have been written for no one to ever read. The words go silent and exist as so many, silent and unread, eventually placed in a cigar box or wrapped in paper to live on the top shelf of a closet. It is those things that often are unearthed, if one is fortunate and given life, as I am trying to do with everything being shown here. Ernest Julius's diaries fell in the hands of his younger brother Frank, my grandfather and from there years later into his son's hands, my father Ernest Anders who was named after his uncle Ernest Julius. It was my father who made me aware of Ernest Julius and his photographs and diaries. These words and the other diaries posted on this site will give you a glimmer of who Ernest Julius was, a man my father and I wish we had the opportunity to know. But it is in these words and photographs of him from a young boy to the soldier who ended up scurrying around the battlefields of France in 1918 that brings him to eternal life. We are fortunate in that, to say we know him, far better than we would have if all this was lost to time and memory. I dedicate most of the work here on the site and the images and writing to my uncle Ernest Julius Alfred Erickson, the man that my father first called, "The Man From Painted Woods." Thanks to my cousin Mark Henninger (grandson of Ernest Julius's brother Andy Anders Erickson) of Bismarck, North Dakota for the transcription of the diary that he completed in November of 2016. Also appreciation for the use of his photograph. 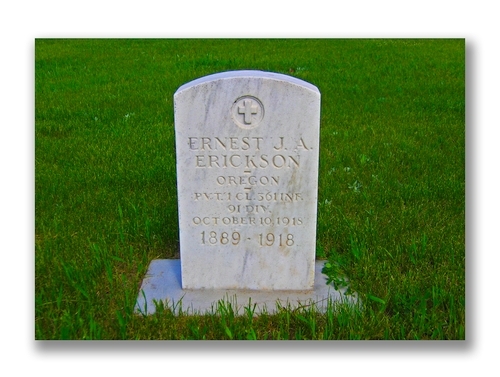 Ernest Julius Alfred Erickson (photograph of his headstone below) is buried at Riverview. And a special thanks to Elena Erickson for getting this project off the ground with the scans of all of Ernest Julius' diaries. The final image below is of my grandfather Pvt. Frank Gustaf Severin Erickson (standing 8th to the left of the US flag) who was with the 308th Infantry- 77th Division - Company H serving in France in 1918. He was a fortunate surviving member of the famed "Lost Battalion." Frank along with less than 200 men escaped out of the ferocious fighting in the Argonne on October 8th, 1918. 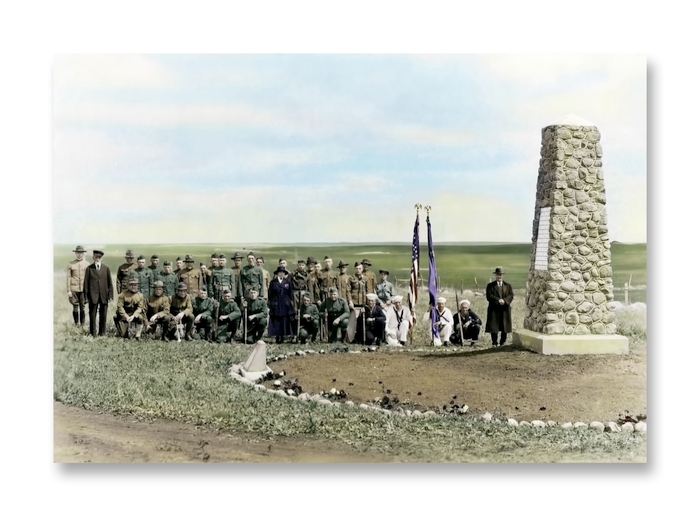 Frank stands at the commemoration ceremony of the Riverview World War I Memorial located along the Missouri River not far from Wilton, North Dakota. Frank's brother in-law, my uncle Ensign Sture Albin Nelson (front row - holding the US flag) is also in the photograph. Sture served in the Navy during the war. My uncle Pvt. Ernest Julius Erickson wrote in his diary starting in September 26th and continued on till October 8th, 1918. That day would be his final entry. 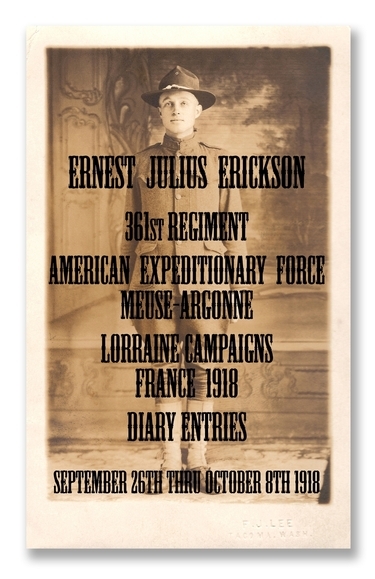 Ernest Julius was with the 361st Infantry of the 91st Division and was serving in Company C. Ernest had been in the intelligence section of the First Battalion through both Argonne Offensives in September and October of 1918. He had also been a scout, sniper, observer and runner. Ernest Julius Erickson found himself along with his regiment in the midst of the Battle of the Argonne Forest, in what would be referred to as The Meuse - Argonne Offensive located on the Western Front in France. It was fought from September 26th 1918, until the Armistice on the the 11th of November, 1918, a total of 47 days. The Meuse-Argonne Offensive was the largest in United States military history, involving 1.2 million American soldiers, and was one of a series of Allied attacks known as the Hundred Days Offensive, which brought an end to the war. The battle cost 28,000 German lives and 26,277 American lives, making it the largest and bloodiest operation of World War I for the American Expeditionary Force (AEF), which was commanded by General John J. Pershing. Ernest Julius wrote these words in dangerous situations, yet having an unique sense of humor in these dire circumstances. I can only imagine what it was like to be stuck down in a cold muddy exposed trench, writing these thoughts as battles raged, sniper fire sounding and German artillery soaring overhead and ofttimes exploding far too close for comfort. He begins his writing one morning on the 26th of September of 1918. We marched all night to a position from where we could follow up the heavy artillery barrage which was just put down on the enemy position for five hours. at 5:30 a.m. we started out crossing the enemy lines without any opposition, until noon when we were held up by machine gun fire by the enemy. cleared up the woods in a few minutes and took some prisoners, then marched and were held up again upon reaching the open space at a farm - where we lost a few men by artillery fire. we reached our objective but had some stiff fighting that we ran into. Snipers and machine gun nests which caused us some delay. dug in for the night. took up the march again, but ran into some more machine gun fire and snipers which were placed in an orchard round a small village. here is where we had the worst opposition. first battalion was in the lead and showed that they were real fighting men. Could not go back to previous position today as the enemy artillery had the place under fire. had to fall back to last night’s camp, but did not lose any personnel. took up the fight again later and gained ground with stiff fighting. a few small losses of men and gained our objective. Took some more ground and arrived at the Huns strong point and had a hell of a time to get them out. Went through the woods and have halted. men are pretty well worn out. Enemy are shelling this woods all the time. No gain against the Hun. guns still working on this place, but doing little damage. our kitchen arrived day before yesterday. had hot coffee for the first time since we started and I say it was not hard to take. Still here and listening to the music of the Hun guns. Hell has turned loose for certain. me and my pal Kune have been in our hole face down waiting for the big one with our name and address on it, but evidently Fritze does not know our names yet. one shell struck a dug out only about eleven feet from ours, killing one and one badly wounded. took the wounded back to first aid and going through the woods I would not have given 2 cents for the four of us that carried the mangled back, for again hell opened up its doors for us. our road was lit up with bursting shrapnel, but got through without a scratch. Got relieved, but we were halted in the woods when we were again shot to pieces, that's where I got my first taste of shrapnel. received a small bruise in the back which did not feel good, thought I was wounded bad, but came to find out it was not all that bad. it was that first blow to the back, what put me out. We are now back of the Huns and it seems good to be back to where the big shell are not falling. also got a letter or two from home which makes things so much brighter. Got cleaned up and feel so much better. how much nicer it is to be back of the big guns than it is to be in-between them. it always makes things more pleasant when you can hear the shells go over you and towards the enemy than when they come your way. for then you do not know when one of those big ones may take a fancy and want to get in the same hole as yourself. There sure is not room for the both of you and in all, as most cases you go out in pieces. Moved our camp back a few hundred meters. we were all hoping that they would take us back to same billet, but not yet. had a letter from the best girl in the states yesterday which makes all the world smile so much brighter. This is the date we were moved back. thinking that we was going to get a rest. but was again called to the line. marched all night in a freezing rain and the vicious mud sure sticks to a man’s feet. Unfortunately for my uncle, Ernest Julius was shot and killed by a sniper on October 10th, 1918 while in action in the Argonne Forest during the Meuse Argonne Offensive. Ernest Julius along with another soldier of Company C, Pvt. Jesse A. Keene had been given orders to deliver a message to the commander of Company B of the 362nd Infantry. They were well underway when they came under attack by snipers. Both men attempted to run for cover when Ernest Julius was shot. Pvt. Keene witnessed his partner getting hit and laying motionless for 5 minutes on the ground out in the open. Pvt. Keene then withdrew and headed back to safety, giving his report of the incident to the Company commander. 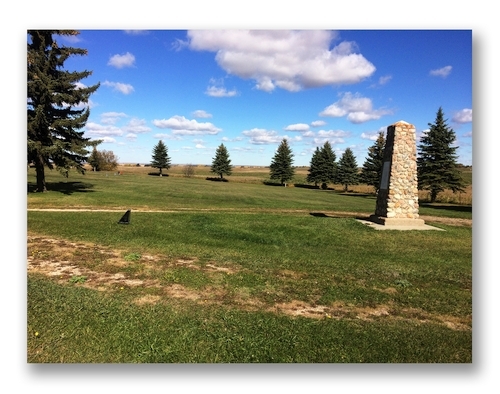 At some point later Ernest Julius's body was retrieved and over time brought back home to Dakota. Found on Ernest's body was his blood stained diary which he wrote in regularly and his last entry ended abruptly. He had began a new sentence, very likely written that morning and Ernest had just written the letter ”s,” when the writing ended there, forever silent. I own three of Ernest's diaries and they have helped enlighten me on my uncle's life, opened up more who he was and what he may have become if he had made it back to Dakota. Over the years I have thought of Ernest Julius and like my father, we both have been affected by this man's life. His stories were fascinating and in-between the lines even more compelling. For it is for eternity, one of those what ifs, what if he had kept writing. He was a true spirit living on in his words and the rest is for us to imagine. I will continue to find out as much as I can about him. Ernest Julius' life was cut short with all the promise of any young man. My father, Ernest Anders Erickson was named after his uncle Ernest Julius and carried with him his memory from stories he was told by his father Frank, his grandmother Christine, uncles Andy, Helmer & Al Erickson and aunts Vera And Abbie (Lincoln) Erickson. In time my father inherited Ernest Julius’ archives, which included this diary. He became interested in his uncle he called,”The Man From Painted Woods." It is time for his final words that he wrote on the battlefield in France in 1918 to be seen. It enables family and friends that are interested, to read and look through my two uncles and grandfather's archives and photographs.